The last two decades have been marked by a massive scramble to find new and sustainable ways to generate electricity. People have tried to capture the power of wind, water and the sun to replace conventional sources of electricity such as coal and petroleum. However, renewable energy needs to be stored in electric batteries so that it can be used when needed. Today, electric batteries are omnipresent at home across numerous electronic gadgets such as mobile phones, remote controls, wall clocks, watches. These can be single-use (disposable after the first use) or secondary (rechargeable) batteries. A team from the International Youth Society of Eco Friendly & Renewable Technology (IYSERT) has developed a unique technology that aims to solve the problem of waste management and production of sustainable energy. The team has used easily available materials like a bucket as their container, vinegar and metal strips as conductors. To make the electrical connection, they use copper and zinc strips, connecting wires and porous strips. The most interesting part of their product is the input – organic kitchen waste like vegetable and fruit peels, rice and food leftovers. Vinegar is added to this waste. When this circuit comes together, it works on the same principle of other batteries. Ions (charged particles) that are formed due to the reaction of vinegar with the kitchen waste, move into the copper wires. This causes a flow of charge, which is essentially electricity. Another team of innovative students led by Ankita Basu from St. Xavier’s College in Kolkata has added a new twist to the conventional solar charger by adding multiple USB connectors to one end of the circuit that allows you to connect and charge various devices. The basic elements of this solar photovoltaic cell are simple: it is made up of silicon, a material that generates electricity when exposed to sunlight. So, the infinitely available sunlight, especially in a country like India, is the only input. The apparatus required for the circuit are a printed circuit board, IC LM317, transistor BD135, heat sink, Presets of different values, 1.2ohm/2w metal oxide resistor, 6A diode, 1N5408, rotary switch, on-off switch, inclination meter, LED with holder, meter, fuse, connector, box (4″x7″), knob, solar panel (6v, 12v), solder and connecting wires. This pilot project has implemented it the Computer Science department, of St. Xavier’s College, Kolkata as well displayed in various science fairs. One major limitation for this solar charger is that the solar panel is costly due to the presence of pure silicon and it is weather dependent. While their separate advantages and disadvantages give a good insight into the capabilities of the products, a quick comparison of both products will allow us to judge them even better. Looking at both technologies, we can observe that innovators have tried to make batteries more sustainable by improvising on the input material that is used to generate electricity. 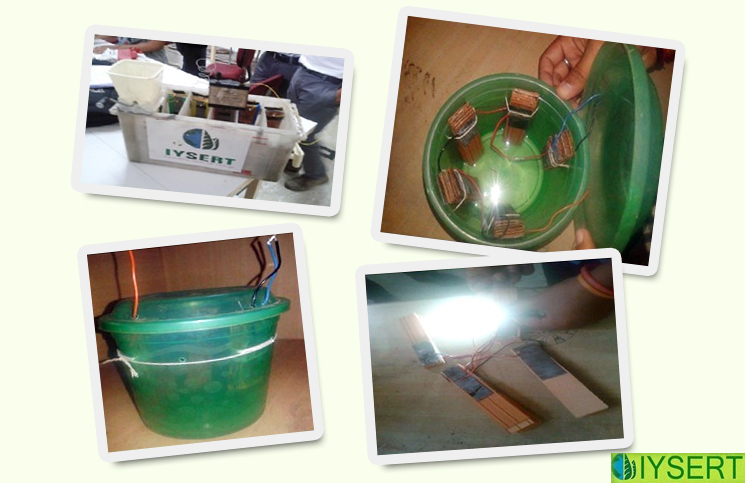 The team at IYSERT has also sought to bring down the cost of batteries by making easy and inexpensive circuits. While, the IYSERT team has effectively recycled kitchen waste, the St. Xavier’s College team utilizes the abundantly available sunlight. However, it has to be seen if these innovations are commercially feasible to be produced in a large scale. These technologies do hold a lot of promise for the coming generations that might face an energy crisis, if they do not adapt to eco-friendly technologies soon. I am a Ph.D. candidate in the Department of Chemical Engineering at the University of Washington, where I work with two fantastic advisors - Jagjeet and Janice Bindra Endowed Associate Professor Jim Pfaendtner at UW and Senior Scientist Christopher J. Mundy at the Pacific Northwest National Laboratory - and a wonderful research group. Right before heading UW in 2014, I completed my undergraduate degree in Chemical Engineering from Birla Institute of Technology & Science, Pilani, India. Can Bakey’s Edible Cutlery Change our eating Habits? Sir, i am interested patent and innovation. I know NIF and others concern since Mahesh Patel Sir. I will approach in short time for some patents work.